A Full Bodied, Well Balanced Wine Trading Game with a Fun Finish! Here's a quick idea of how to play: Buy favorite wines, collect grapes and trade them in for decanters. Sounds easy enough but add Import Taxes and serving faux pas and it becomes a little more difficult and a lot more fun! Learn as you play. Each deed back contains wine descriptors and fun facts about each wine. Can you pass the Wine Quiz cards? What is the term for the science of making wine? Draw another card and you may take second place in the Southampton Homemade Wine Competition! It's all fun and games until you are sent to the wine cellar, then you are out of the game and aging for three turns. So choose your token and advance to cheers! Who knows? You may soon be elected president of the wine club or you may be penalized for serving obtrusively malodorous cheese! This game pairs well with friends, family and fun. Varietal 100 percent playful. For ages 8 to adult 2 to 6 players. Need something new and exciting for an important business tradeshow, fundraiser, or annual meeting? Need a fun game for your child's birthday party or school carnival? Then you need Midway Monsters' 12" dry erase prize wheel. 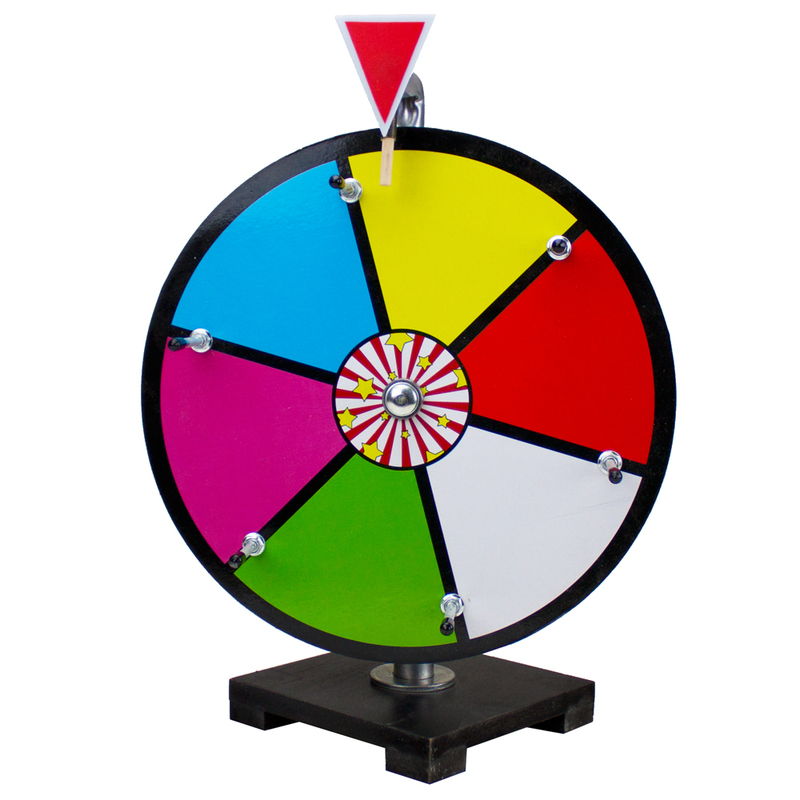 Featuring a face with six colorful sections, digitally printed and sealed with dry erase laminate, this prize wheel is completely customizable for any event, just add a dry erase marker! Wipe clean with a dry cloth to use and reuse your wheel for countless different contests, promotions or parties. 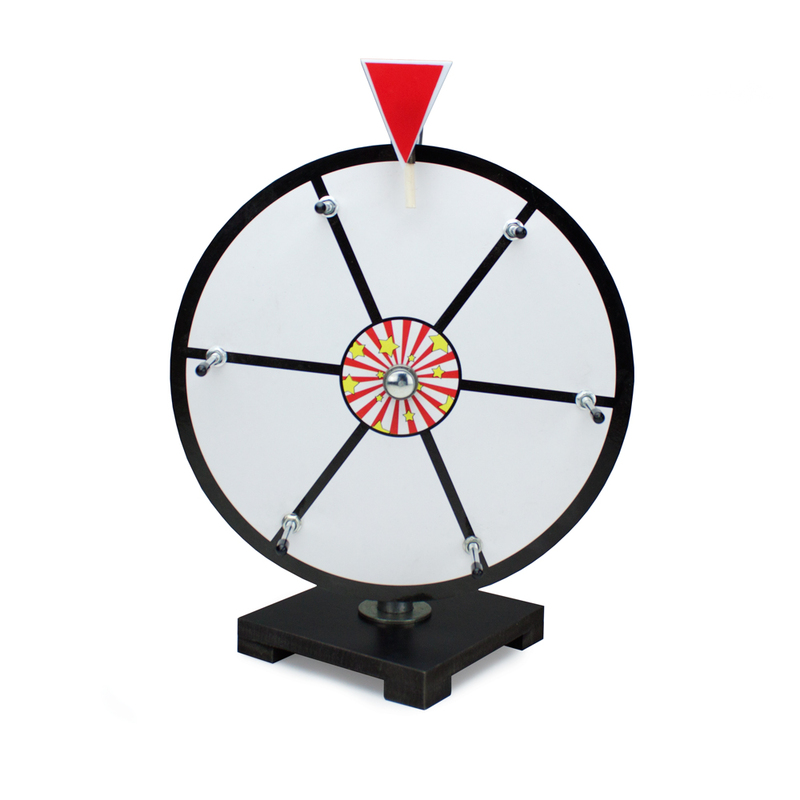 Each prize wheel is cut from 1/2" thick, pressure treated particle board, fluidly spins on a dual bearing hub, and stands on a stable 6" base. Fitted with sturdy steel pegs, the wheel produces loud, satisfying clicks when spun. One of the greatest strengths of tabletop gaming is that the possibilities are literally endless, limited only by the imaginations of intrepid players and gleefully scheming dungeon masters. Campaigns, characters and settings are adaptable to an infinite degree because the game assets exist in the mind, because they aren't printed on game boards, trading cards, and the like. Often the only physical elements of a table top game are character sheets, maybe some miniatures, and a set of fair but unforgiving polyhedral dice. Think of battle mats as steroids for your campaigns. Formerly nebulous dungeons now have distinct, exacting shapes, like bottlenecks to force tough engagements, or blind spots for traps and ambushes. Devote a single 1" hex amongst an ocean of 2,460 others to house a nefarious pressure plate. Lend your post-apocalyptic wasteland some scenery to appreciate and geography to negotiate. Graph out precise areas of effect, reveal lines of sight. Battle mats add lucidity, but also complexity. Our double-sided Grand Campaigner is made from durable, textured vinyl. It travels and stores well but lays flat when unrolled, unlike laminated card stock mats. Each Grand Campaigner measures a spacious 48" by 36", featuring an absurd 1,564 square inches of usable space. Accommodating several styles of play and sets of rules, the Grand Campaigner uses both a hex and a grid system, packing an impressive 2,461 hexes and 1,564 squares onto a mat 4' wide and 3' long. As they are made from vinyl, our Grand Campaingers are erasable when used with wet-erase markers, like the ones used with overhead projectors. One wet-erase marker and eraser is included. If you experience residual coloration, wash with a toothbrush and warm, soapy water. 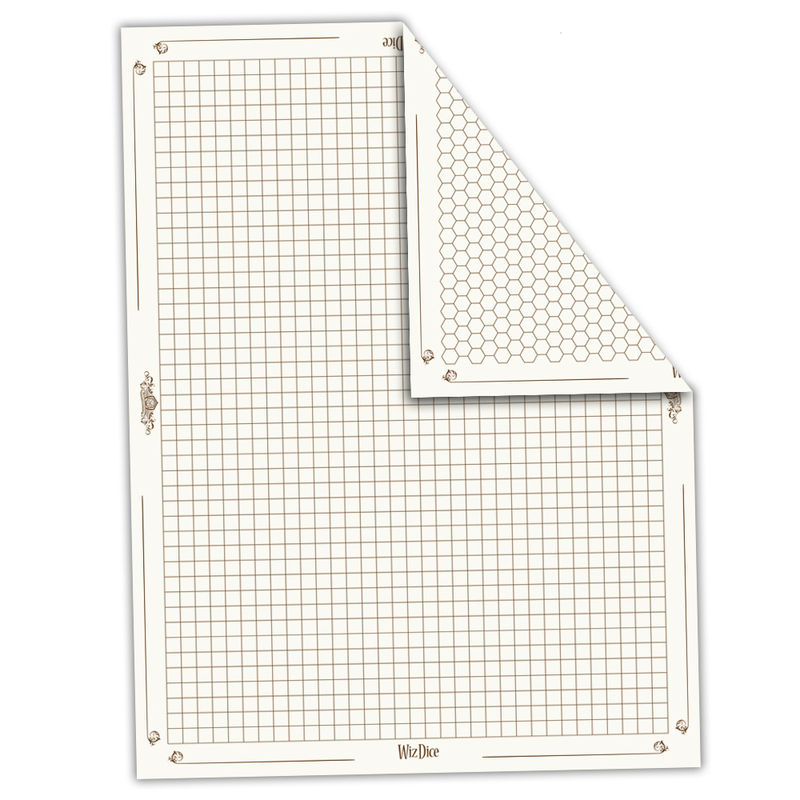 If you're looking to create a more lasting, reusable map, the mat is also compatible with dry erase and permanent markers. To most western players, the game of Go is an enigma. Invented in China 4,000 years ago, it has no proper analogue in the West. It's like chess, but endlessly more complex. Focused more upon territory control and less about capturing the opponent's pieces, there are between 150-250 valid moves a player could make on any turn. For chess, this number never climbs above 37. It is said there have never been two identical games of Go, and there does not yet exist a computer program that can reliably beat Go experts-let alone the masters. Despite this, Go is surprisingly easy to learn. There are only two rules: 1. Every piece that remains on the board must have at least one open point (called a "liberty") directly next to it, and 2. Players are not allowed to make a move that would return the game to a previous position. Unlike many listings for separate boards, bowls and stones, this complete set includes a matching goban (board) and go-ke (bowls) with a beautiful dark wash, as well as a full complement of 180 white and 181 black go-ishi (stones). Single-convex in the traditional Chinese style, these go-ishi are made from bakelite, have a good weight, and, when placed, make a satisfying clack. 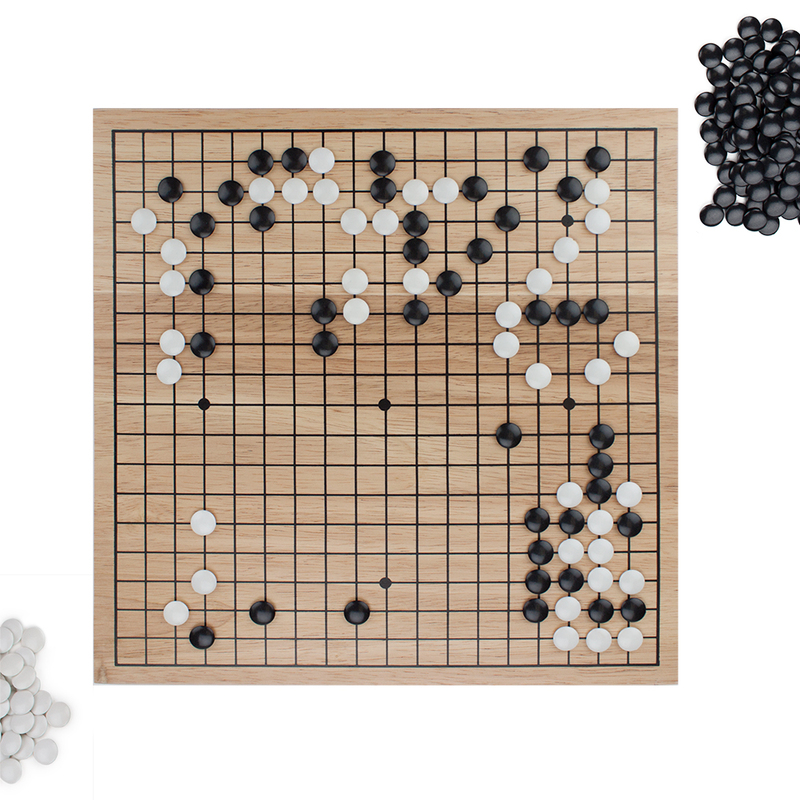 Traditionally, Go boards are not a perfect square, but slightly oblong, which thanks to foreshortening creates for players the visual effect of a perfect square. This is a solid 47x44cm table board with the standard 2cm thickness and great heft. Better yet, itG+™s reversible: the top side features the time-tested 19x19 board layout, and the underside features a bonus Xiangqi layout perfect for Chinese board game aficionados. Need something new and exciting for an important business tradeshow, fundraiser, or annual meeting? Need a fun game for your child's birthday party or school carnival? Then you need Midway Monsters' 24" dry erase prize wheel. 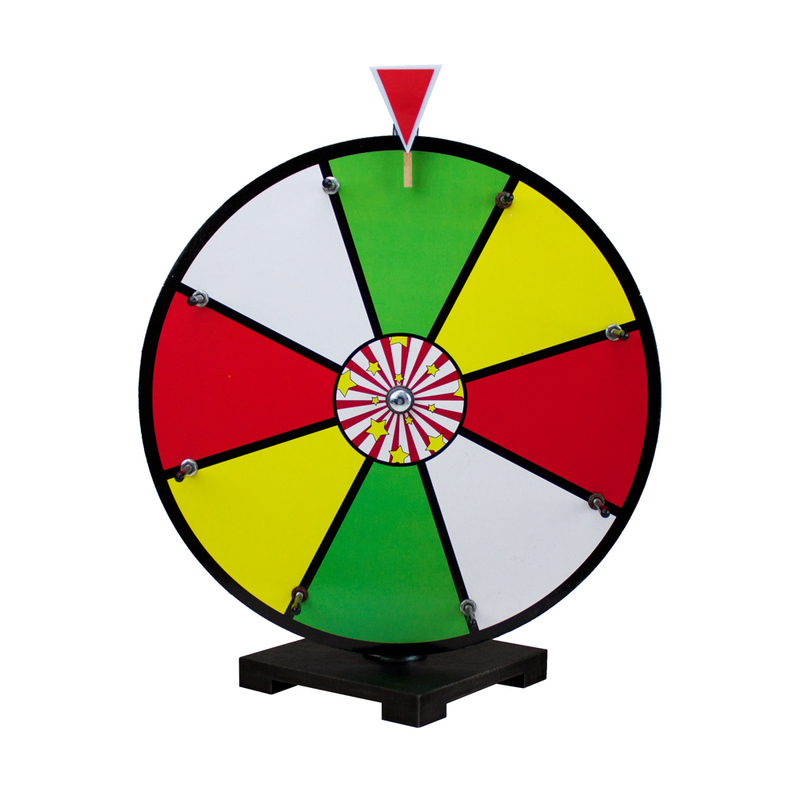 Featuring a face with twelve colorful sections, digitally printed and sealed with dry erase laminate, this prize wheel is completely customizable for any event, just add a dry erase marker! Wipe clean with a dry cloth to use and reuse your wheel for countless different contests, promotions or parties. Each prize wheel is cut from 1/2" thick, pressure treated particle board, fluidly spins on a dual bearing hub, and stands on a stable 8" base. Fitted with sturdy steel pegs, the wheel produces loud, satisfying clicks when spun. Featuring a face with six white sections, digitally printed and sealed with dry erase laminate, this prize wheel is completely customizable for any event, just add a dry erase marker! Wipe clean with a dry cloth to use and reuse your wheel for countless different contests, promotions or parties. Bible Trivia is the game of knowledge and divine inspiration. Over 700 trivia questions challenge players to relive history, heroic characters and inspirational messages featured in both the Old and New Testaments. Players will identify people, places and events within the Bible while remembering important messages from God's word. This game is a perfect activity for Bible study groups, church gatherings, youth group activities and more. Bible Trivia was developed by Diane Leggewie, a graduate of Master's College in Newhall, CA. Leggewie has a degree in theology and has been active in children's ministry for over 12 years. 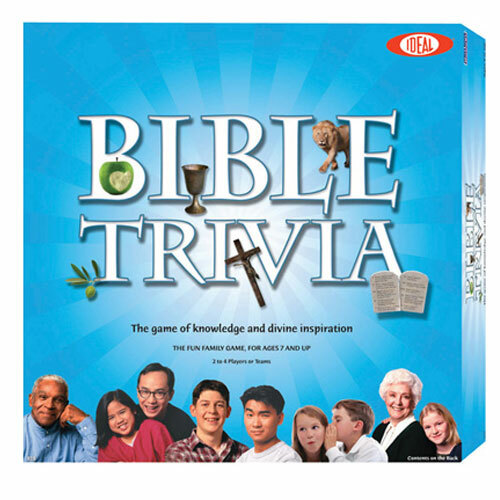 Each Bible Trivia game comes with 750 adult questions, 100 children's questions, 20 judgment cards, four playing pieces, die, a game board and instructions. This game is recommended for 2-4 players ages 7 and up. Have fun on the farm while learning facts about Windmills, Grains and Chickens. Includes 6 player boards, *red cardstock bingo squares and 42 picture cards with an image on the front and facts on the back. Contains small parts. Not intended for children under 3 years of age. Made in the USA. Published on the same paper-like material used in shipping envelopes, Indestructibles are 100% baby-proof: chew-proof, drool-proof, and rip-proof. That's because Indestructibles not only will not tear or turn gummy with teething, but they are also completely washable. Giddy Up and learn some facts about horses, like Arabian, Quarter Horse and Horseshoes, and their world while playing Horse Bingo. Includes 6 player boards, *plastic bingo chips and 42 picture cards with an image on the front and facts on the back. Contains small parts. Not intended for children under 3 years of age. Made in the USA. For a dog-gone fun time, learn about different breeds of dogs including Labrador Retriever, Bulldog and Basset Hound. Includes 6 player boards, *green cardstock bingo squares and 42 picture cards with an image on the front and facts on the back. Contains small parts. Not intended for children under 3 years of age. Made in the USA. 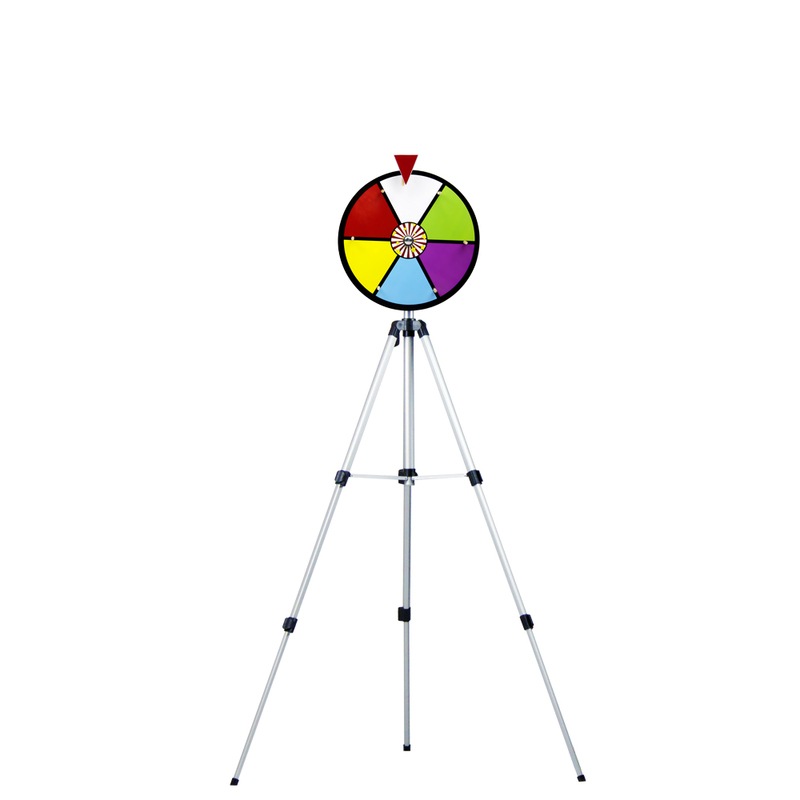 Whether you have an important business tradeshow to attend, need something new and exciting for a fundraiser or annual meeting, or need a fun game for your child's birthday party or school carnival, our 12 inch Color Dry Erase Prize Wheel with stand is the perfect solution. Need something new and exciting for an important business tradeshow, fundraiser, or annual meeting? Need a fun game for your child's birthday party or school carnival? Then you need Midway Monsters' 16" dry erase prize wheel. 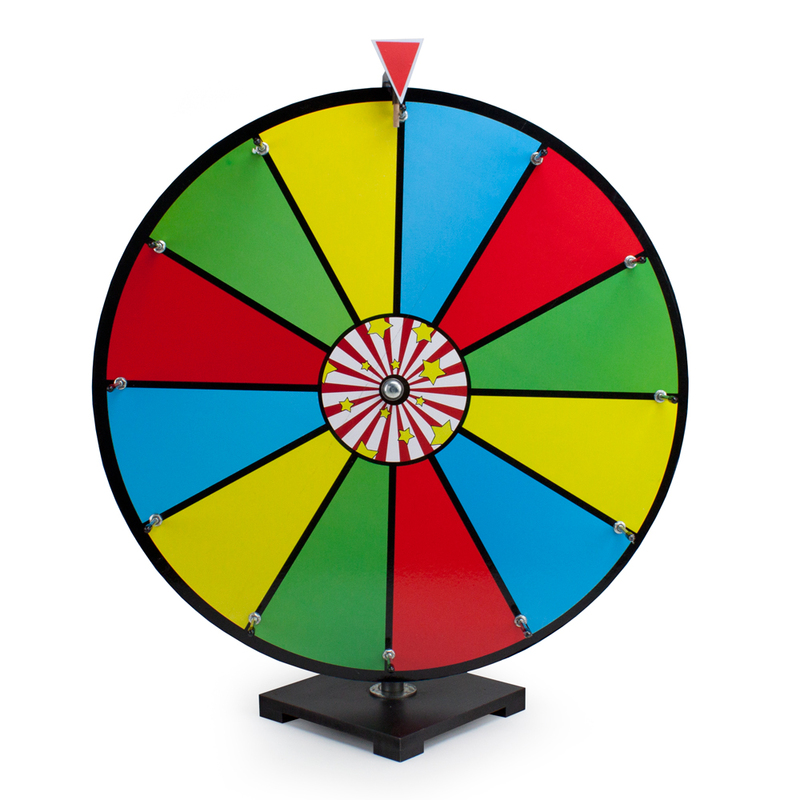 Featuring a face with eight colorful sections, digitally printed and sealed with dry erase laminate, this prize wheel is completely customizable for any event, just add a dry erase marker! Wipe clean with a dry cloth to use and reuse your wheel for countless different contests, promotions or parties. Each prize wheel is cut from 1/2" thick, pressure treated particle board, fluidly spins on a dual bearing hub, and stands on a stable 7" base. Fitted with sturdy steel pegs, the wheel produces loud, satisfying clicks when spun. 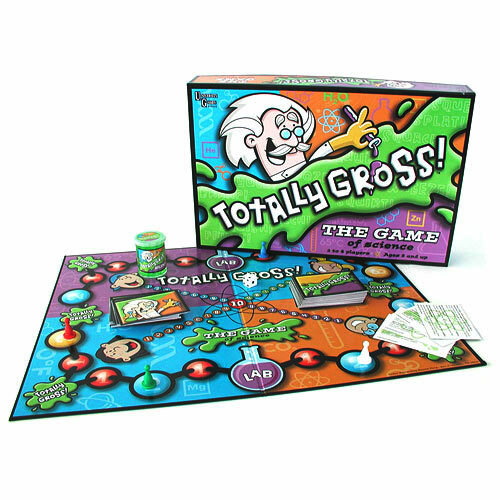 If you like science and gross facts, the Totally Gross Game is perfect! Full of amazing facts about our wonderful world, Totally Gross helps kids absorb and understand all of the major scientific disciplines. During play, kids travel around the board game answering questions and engaging in crazy antics. The first person to stretch his or her slime 10 point spaces and complete a lab experiment wins! Each game includes a die, a game board, four playing pieces, a jar of gross slime, 140 question cards, 50 gross out cards and 30 lab cards. This game is best suited for 2-4 players ages 8 and up. Can the Ouija board predict the past, present and future? First introduced in 1891, the Ouija Board has been a source of entertainment for more than a century. Players place the game board between them and lightly touch the message indicator with their fingertips. One play asks a question, such as, "What grade will I get on my math test?" Concentrate very hard, and then watch as the indicator begins to move seemingly on its own accord to spell out the message. Questions can also be answered with numbers, or in a yes or no format. Each game comes with an Ouija Board, and an electronic message indicator. Prior to use, wipe the board with a soft, dry cloth to remove any dust or moisture. Do not store in a damp place. This game requires three AAA batteries for use (not included). 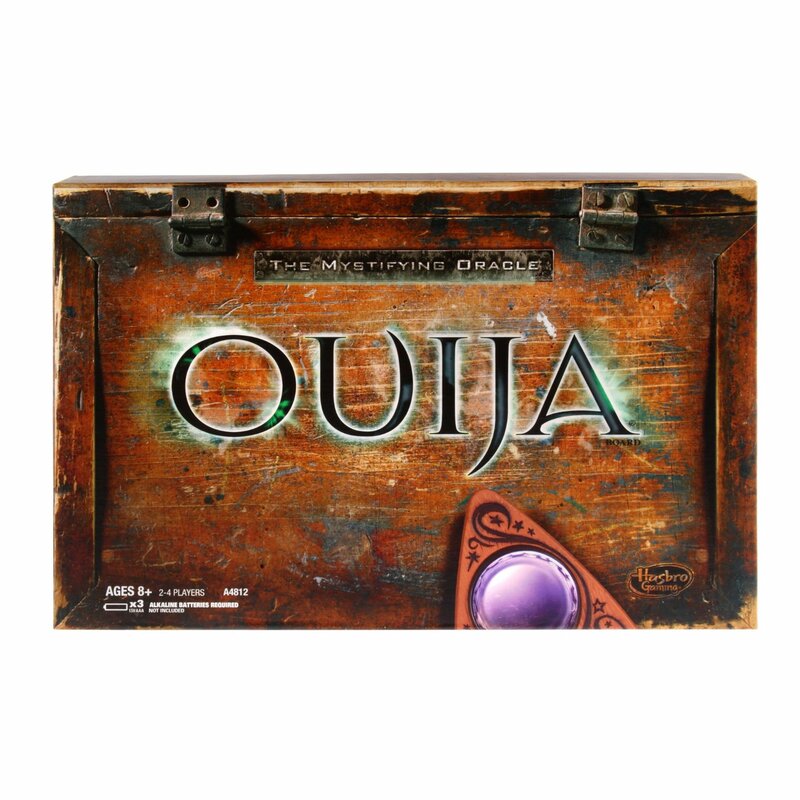 The Ouija Board is recommended for 2 or more players ages 8 and up. Say Anything Family Edition is sure to provide hours of entertainment. Playing is easy. Ask a question from the card you draw. Everyone else writes the answer and turns it face-up. You secretly choose your answer, and everyone tries to guess what you selected. Each game comes with 360 topics on 60 question cards, six dry erase boards, six dry erase pens, one select-o-matic 6000, 12 player tokens, one dry erase score board and one set of instructions. A free storage bag is also included. This game is recommended for 3-6 players ages 8 and up. The average playing time is 30 minutes. 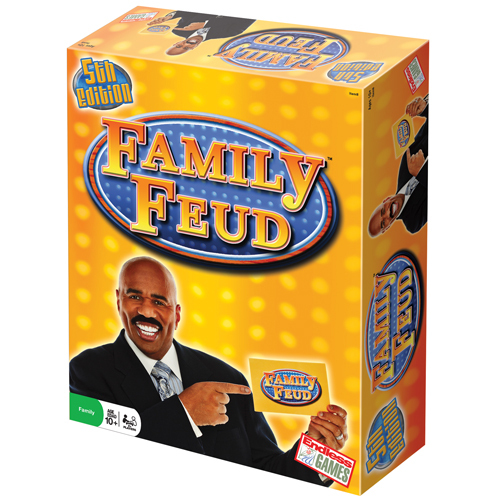 Survey says: Classic Family Feud's fifth edition board game is an instant hit! 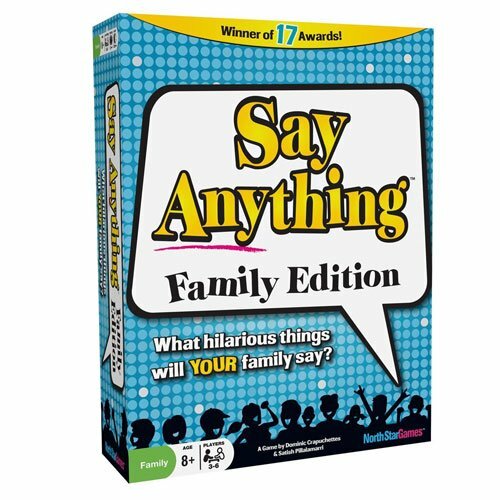 Bring one of America's best-loved TV shows to your family game night with this fast-paced and exciting board game. Featuring tons of survey questions from the actual game show, Classic Family Feud contains many rounds such as Face Off, Fast Money and Fun. Each game contains a scoreboard, an answer board, a wipe-off marker, a survey question book and a strike indicator with three Xs. This game is best suited for ages 10 and up and is designed for three or more players. For more than half a century, Scrabble has been America's favorite word game. Throughout the years, different variations and editions have been introduced, but the concept has remained the same. Score points based on the words you create! 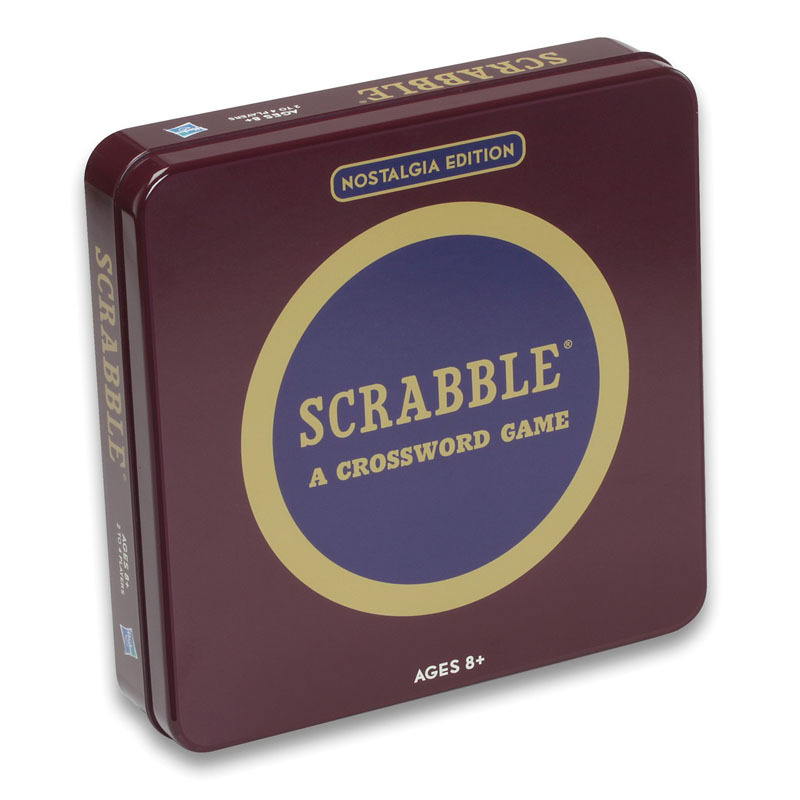 This Scrabble game in a nostalgic collector's tin depicts the game as it was in 1948. This item is perfect for displaying on a collector's shelf, or for everyday use! Each game comes with a full-size game board, 100 wood letter tiles, four vintage wood tile racks, a canvas tile pouch and instructions. Scrabble is designed for 2-4 players ages 8 and up. Khet 2.0 is a game that combines lasers with strategy. Four Egyptian-themed pawns are used during game play, including Pharaoh, Anubis, Pyramid and Scarab. Some pawns will have one or two mirrored surfaces, while others have none. 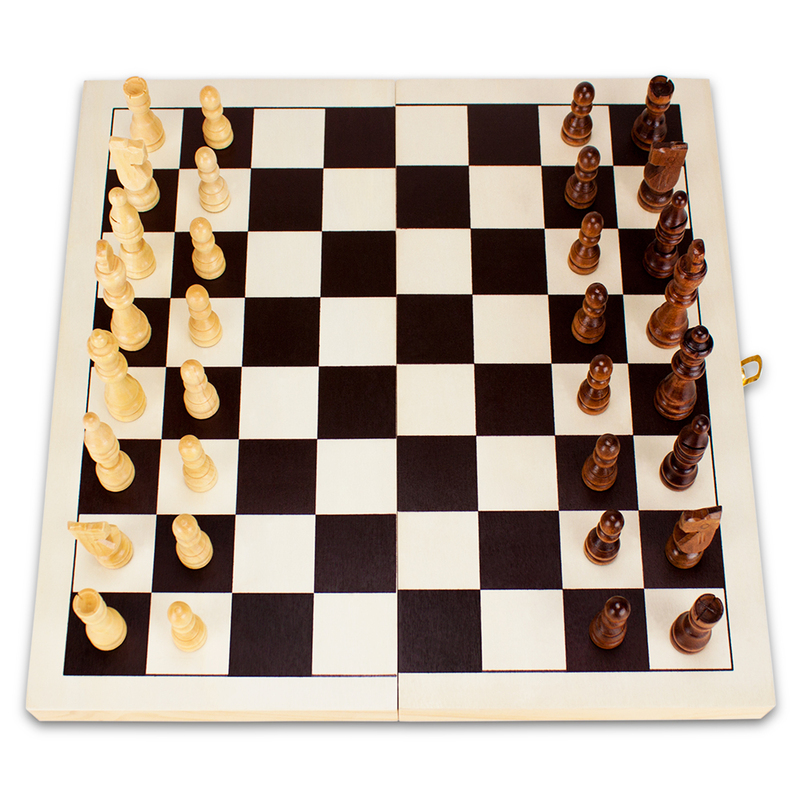 Pawns can be moved forward, backward, left, right or diagonally. Additionally, they can stay in the same square and rotate a quarter twist. However, once a pawn has been moved, a real laser diode built into each player's Sphinx piece is fired. Be careful, because anytime a laser hits a non-mirrored surface on a playing piece, that piece is removed from the game. The object of the game is to illuminate your opponent's pharaoh, and keep yours safely in play. 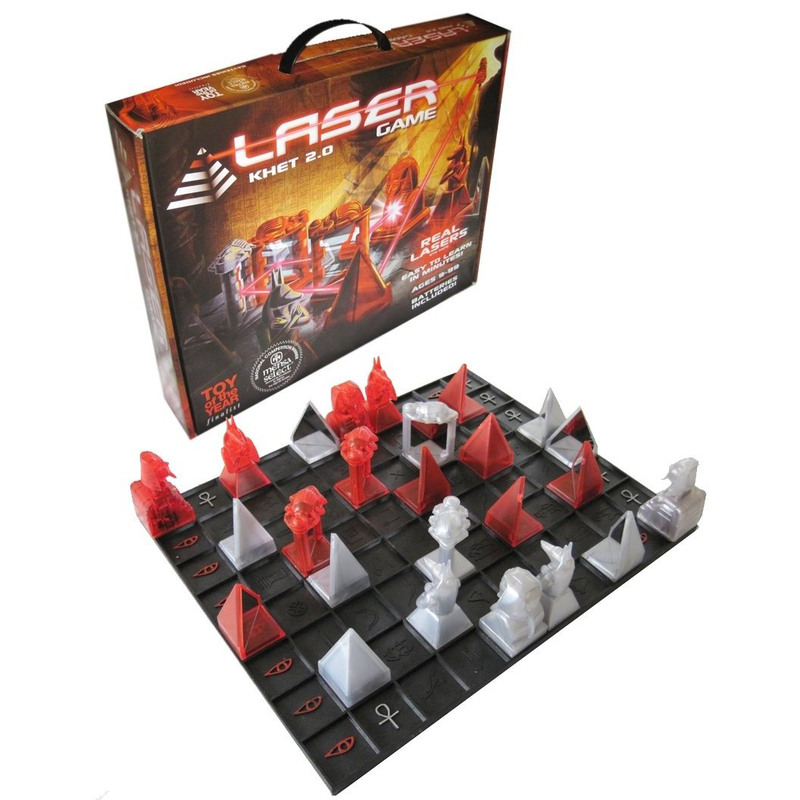 A combination of checkers and chess, this game features eye-safe lasers. Learning to play is easy, and batteries for the game are included. Khet 2.0 is recommended for ages 9-99. It was selected as a Toy of the Year Finalist, and was a Mensa Select national competition winner. Cribbage is a fun, brain-teasing game that is sure to provide hours of entertainment. Using a wooden board, plastic pegs and a deck of standard playing cards, players will compete to be the first to score 121 points. 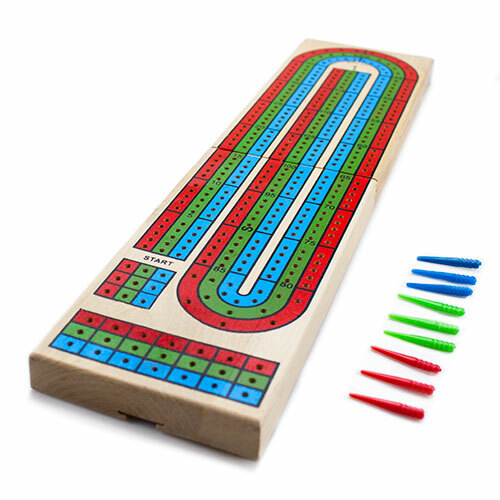 This cribbage board features three fun colors, red, blue and green. Made from high-quality wood with a durable hinge for easy closure, this cribbage game features a plastic slot on the back for convenient peg storage. Cribbage is a game that can be played with two to four players. 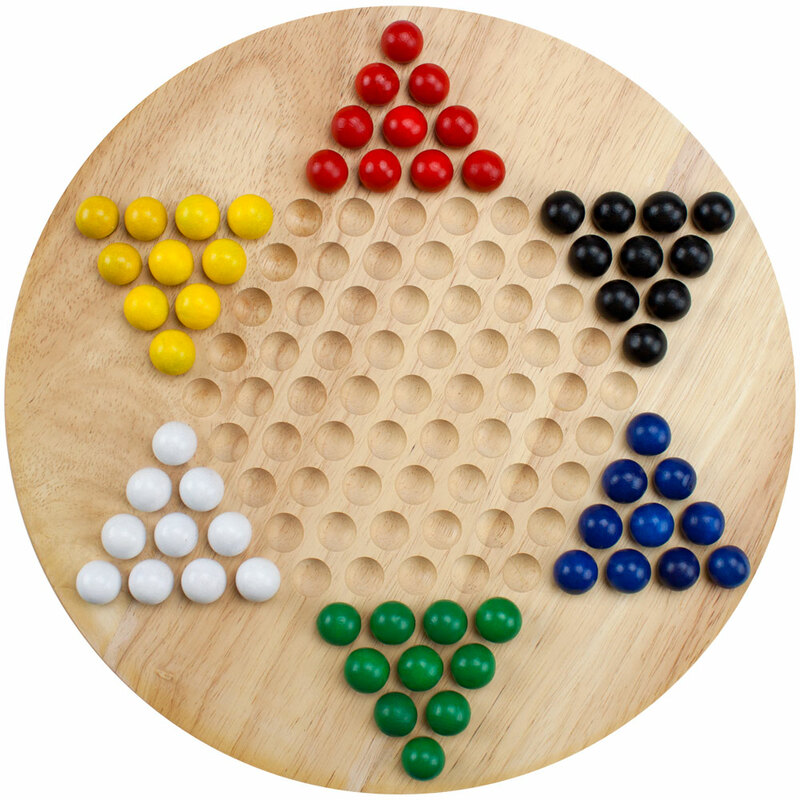 For a two-person game, each player takes two matching color pegs and places them in the starting positions on the board. Shuffle the cards and the person with the lowest card goes first. The dealer in each round automatically moves one of their pegs three spaces to balance out the disadvantage of going second. Each player gets six cards, and after looking at them, puts two down to form the crib for the dealer's second hand. At the end of the round, the dealer gets the points in the crib. A player's remaining four cards become the draw deck. Depending on what card is drawn, players are awarded points and move their pegs forward in a walking formation, meaning you alternate which peg gets moved forward. Play continues until there are no more cards left. The first person to reach the last space on the board with one peg is the winner. This fun cribbage set contains one board, nine plastic pegs (three red, three blue, three green) a deck of standard playing cards and instructions. Cribbage is recommended for ages 8 and up. As game master, or dungeon master, you control every aspect of your campaign right down to the most minute of details. So why can't you control your GM screen? Free yourself from stock-standard screens full of tables you just don't need, or art assets that just eat up space. This hardy four-panel GM screen is completely customizable--just prepare the content you want on a piece of regular paper and slide it into one of the MATRIX's eight pockets. Throw your players a bone by stuffing the 4 outward-facing pockets with NPC portraits, maps, lore, and more. And then dig their graves by stuffing the inward-facing pockets with all sorts of nasty baddies, traps, and bosses. You can even add notes directly on the waterproof vinyl with the included dry erase marker. 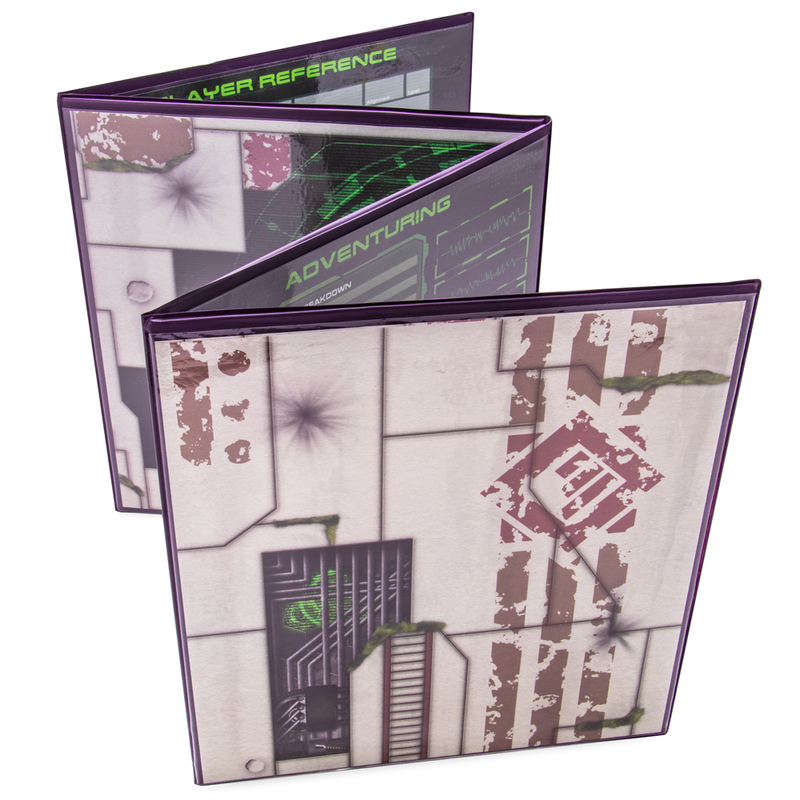 The Master's MATRIX also includes 4 double-sided art inserts and 4 reference pages for Dungeons & Dragons Fifth Edition and Pathfinder (sorry, no Starfinder OGL/SRD yet!). 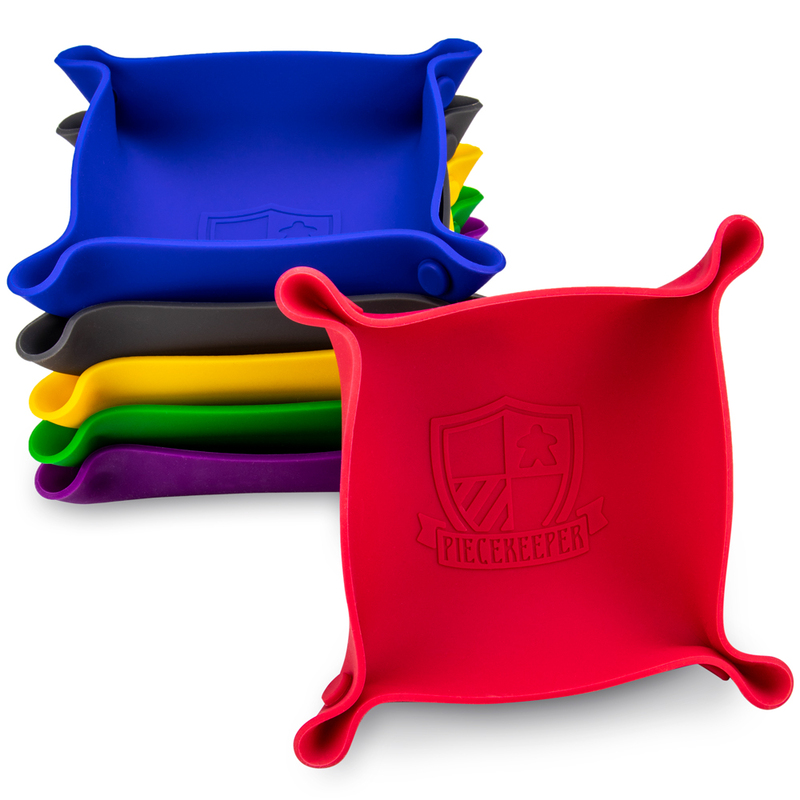 These Piecekeeper board game storage bowls are ready to bring order to the messy world of tabletop gaming. Whether keeping your chits, bits, tokens, or dice in place, you'll have no problem scooping them into your hands. This set comes complete with six classic gaming colors, so blue player and red player can stay out of each other's way G+( at least, outside the game! Between games, these dishes fold into flat, 6" x 6" squares of silicone. Keep them flat in the game box for easy transportation and portability! Keep your pieces to yourself. No more mixing up your tokens or scooping them off the edge of the table. Piecekeepers is here to sort your components so you can focus on your next tactical masterstroke instead of worrying about tidying. Stash them with your favorite games as a tactile, attractive update, or keep them on hand in the game room for no-fuss organization! Was that an alien? Attack! Strap into your spaceship and prepare for a game of cosmic proportions. This set includes all of the pieces you would find in a standard Checkers set, and then something a little extra(terrestrial). 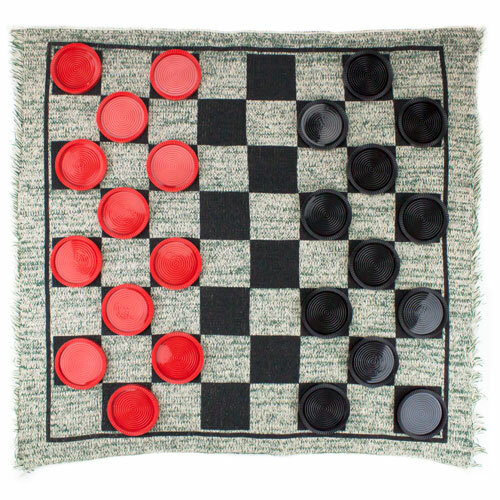 Featuring a whole new set of rules that includes flying kings and new ways to capture pieces, this version of checkers isn't quite like what we're accustomed to on Earth. Of course, standard rules included for those with a taste for tradition. What's more, the gameboard is double-sided for double the fun; try flipping it over for a game of Mega Tic Tac Toe when you're done! 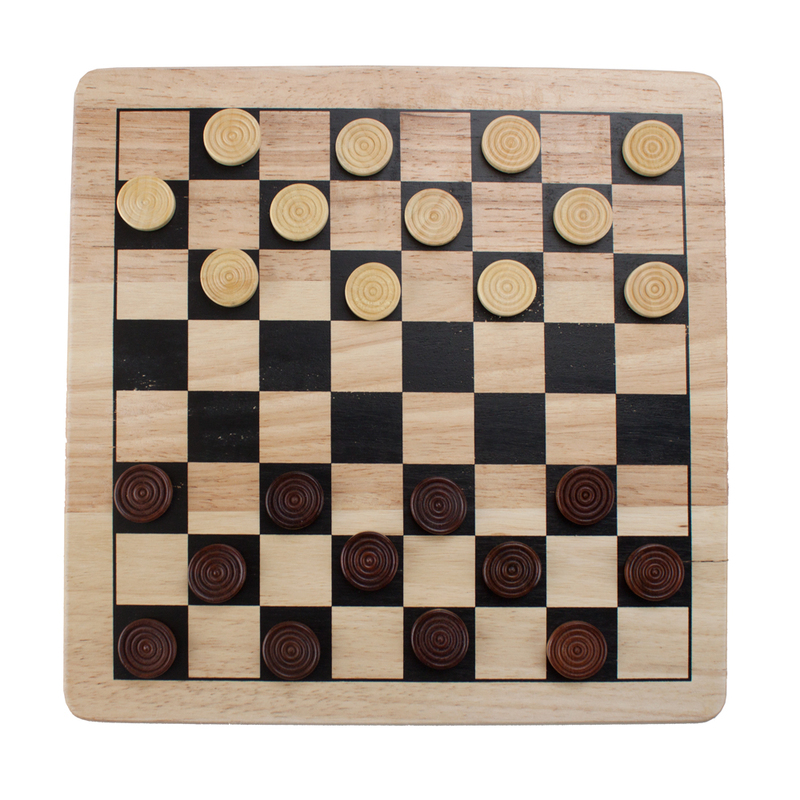 Each set of Galactic Checkers includes premium, real wood game pieces. From the wavy, nebula-shaped board, to the alien spaceship playing pieces. 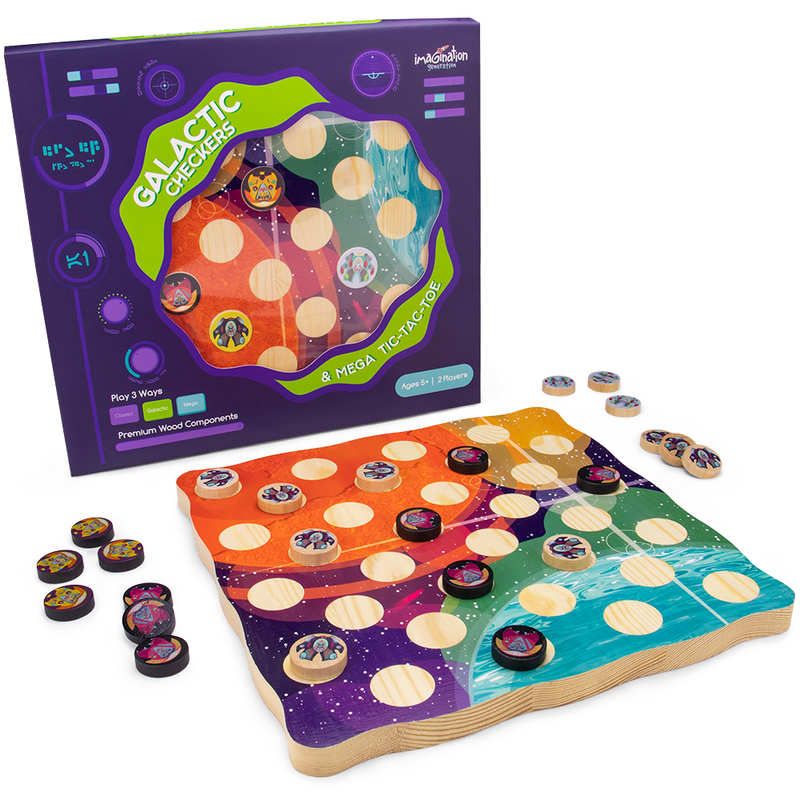 Expand your horizons by jetting off in your space ship and conquering alien foes in this new galactical game of strategy sweeping the Milky Way! This set offers a cosmic spin on classic checkers in addition to the traditional game and mega tic tac toe; that's three games in one! Each piece in this set was crafted with love using premium, solid wood and features our very own custom artwork. Think of battle mats as steroids for your campaigns. Formerly nebulous dungeons now have distinct, exacting shapes, like bottlenecks to force tough engagements, or blind spots for traps and ambushes. Devote a single 1" hex amongst a sea of 724 others to house a nefarious pressure plate. Lend your post-apocalyptic wasteland some scenery to appreciate and geography to negotiate. Graph out precise areas of effect, reveal lines of sight. Battle mats add lucidity, but also complexity. 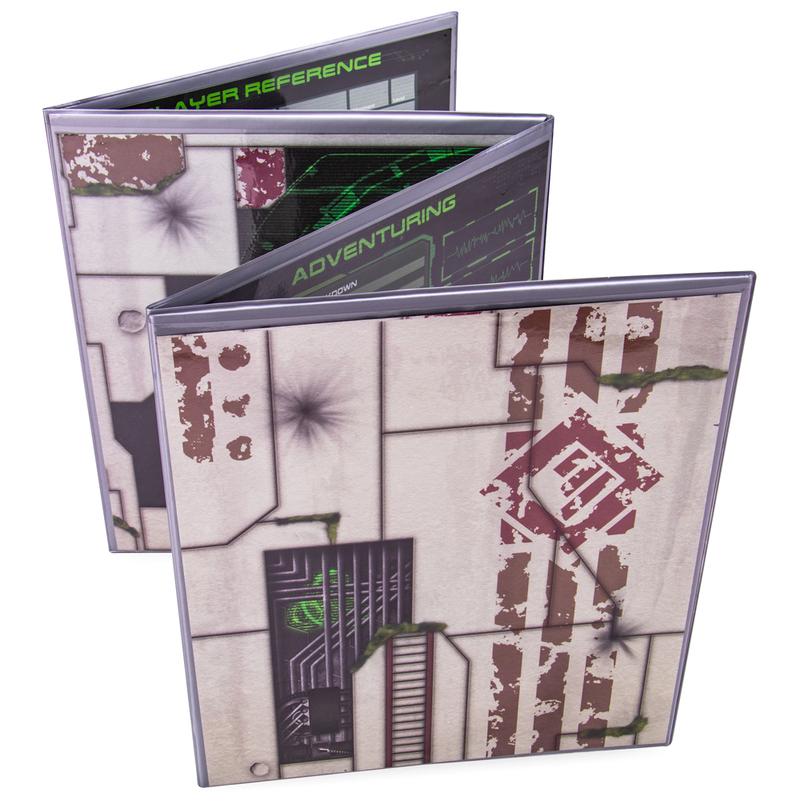 Our double-sided Melee Mat is made from durable, textured vinyl. It travels and stores well but lays flat when unrolled, unlike laminated card stock mats. Each Melee Mat measures a compact 26" by 26", but features a roomy 625 square inches of usable space. Accommodating several styles of play and sets of rules, the Melee Mat uses both a hex and a grid system, packing and impressive 725 hexes and 625 squares onto a mat just over 2 square feet. As they are made from vinyl, our Melee Mats are erasable when used with wet-erase markers, like the ones used with overhead projectors. One wet-erase marker and eraser is included. If you experience residual coloration, wash with a toothbrush and warm, soapy water. 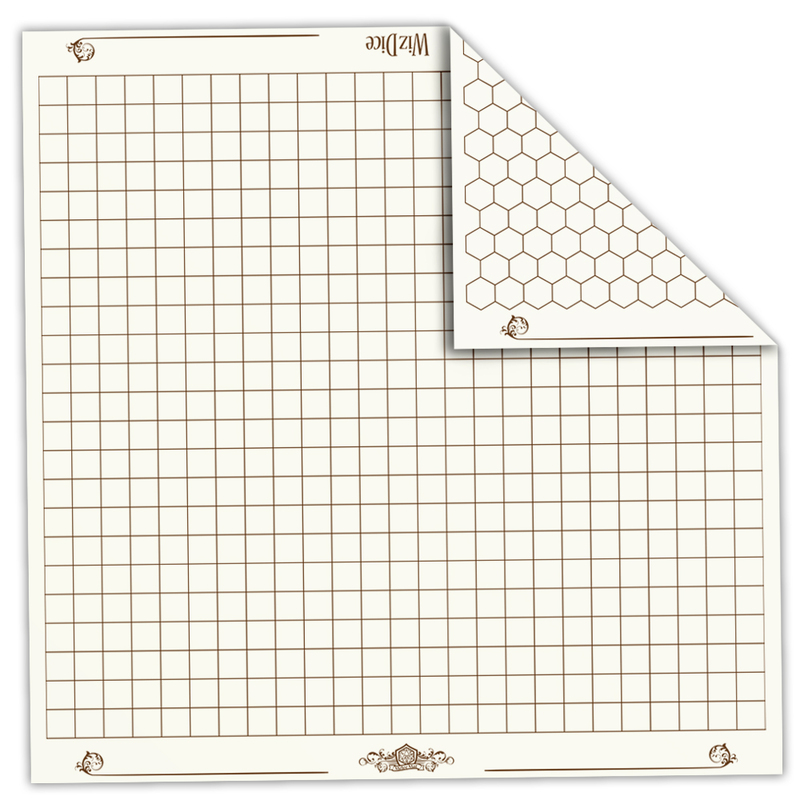 If you're looking to create a more lasting, reusable map, the mat is also compatible with dry erase and permanent markers. To most western players, the game of Go is an enigma. Invented in China 4,000 years ago, it has no proper analogue in the West. It's like chess, but endlessly more complex. Focused more upon territory control and less about capturing the opponent's pieces, there are between 150-250 valid moves a player could make on any turn. For chess, this number never climbs above 37. It is said there have never been two identical games of Go, and there does not yet exist a computer program that can reliably beat Go experts - let alone the masters. 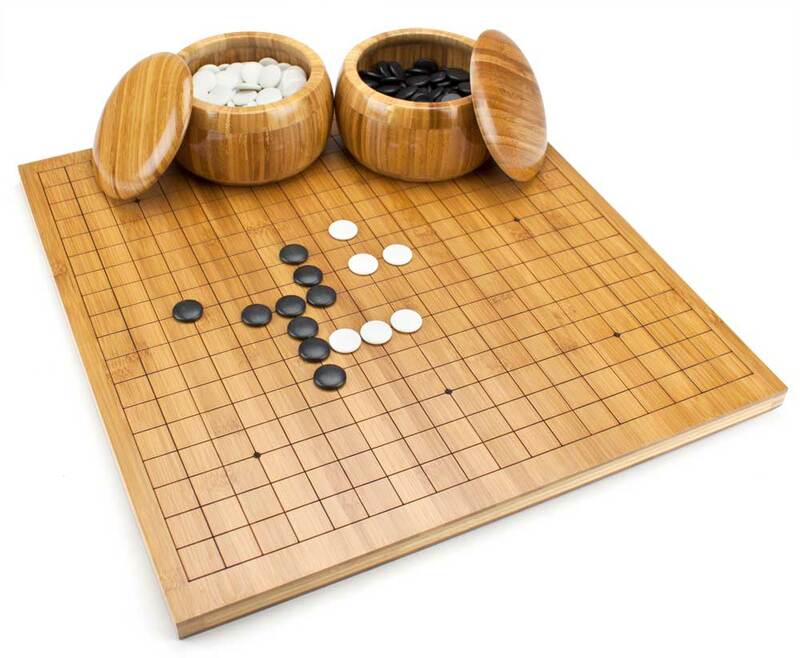 This set includes everything needed to play a game of Go: one 29cm square wood board, and a full set of 361 double-convex stones. Separate resealable bags to store both sets of stones are also included.